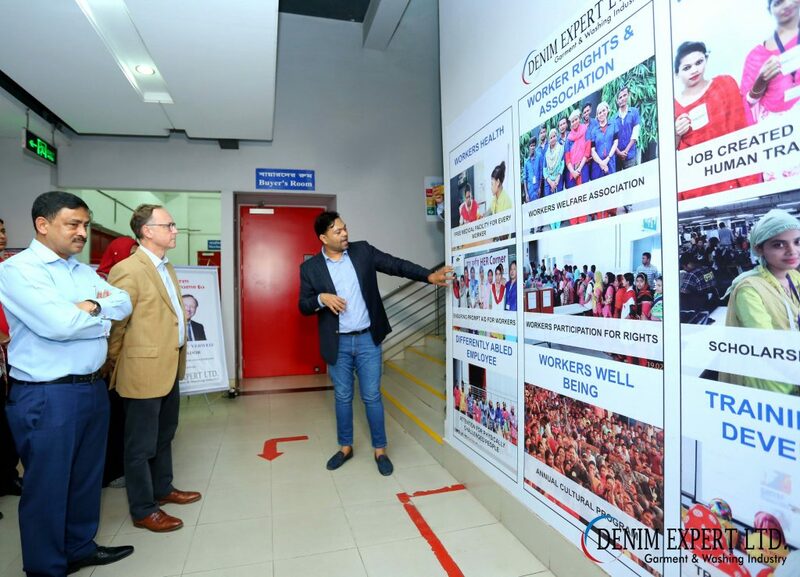 Home Company	NETHERLANDS AMBASSADOR TO BANGLADESH, HE HARRY VERWEIJ VISITS DENIM EXPERT LTD.
Denim Expert Ltd. were honoured to welcome the recently appointed Ambassador to Bangladesh for The Netherlands, H.E. Harry Verweij, to our factory in Chittagong on November 6th, 2018 as a part of his visit to the Rohingya refugee camp at Cox’s Bazar. The Ambassador and the delegation representing The Netherlands, were welcomed to Denim Expert Ltd. by our managing director, MD Mostafiz Uddin, who accompanied them on a tour of the factory premises. The Netherlands Embassy delegation were guided around the factory floors, design and development studio, washing department, laser processing room and the Effluent Treatment Plant (ETP) of the factory. The group were given a short presentation of circular fashion product, modelled by operators form the sewing floor. Developed by MD Mostafiz Uddin at Denim Expert Ltd. the range features garments constructed from materials free of hazardous substances and chemicals, in order to enable the safe flow of material in society. The aim of the developments is to maximize product longevity, sustainability and durability through design and sourcing priorities and to involve transgender and less able bodied workers into the manufacture process, allowing them the opportunity to find gainful employment and make a valid contribution to society. Accompanying HE the Ambassador were Desiree Ooft, First Secretary of the Netherlands Embassy, Nadim Farhad, Political Advisor for the Embassy; and Mahjabeen Quader, Senior Advisor for the Embassy. During his visit HE the Ambassador gave a short interview in which he stated that ‘I arrived in Bangladesh with a lot of anticipation and anxiety, but after 2 months of being here I feel very welcomed and find an attitude of sophistication and a lot, A LOT of entrepreneurship’. MD Mostafiz Uddin said: ‘It has been a matter of immense pride and a great privilege for us at Denim Expert Ltd. to welcome the Ambassador and the delegation to our factory. The delegation has been very impressed by the safe, sustainable and ethical apparel production initiatives in place at our factory, where we include Dutch clients amongst our customers’. Denim Expert Ltd. would like to thank HE Harry Verweij and the rest of the delegation for their visit and for their continued efforts regarding improvements in sustainable and transparent production practices.